If you missed last week’s column, I wrote about Steve Voake’s Daisy Dawson early chapter-book series (Candlewick), which—as I said last week—I think flies entirely too under the radar. That link is here. I feel like I should say something dramatic here, such as, if you read any one 7-Imp post this year, let it be this one. And that’s because today I’m shining the spotlight on the folks at Literacyhead.com, a bi-weekly magazine connecting literacy and the visual arts. They came to my attention months ago, and gracious knows they’ve been ever-so patient with me, since I told them about that long ago that I wanted to post about what they do. I’m finally getting to it. Ahem, better late than never, yes? 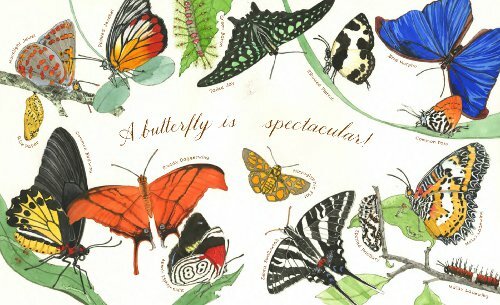 My introduction to this lovely book will be short, because I’ve been out of town, but suffice it to say that fans of 2006’s An Egg is Quiet and 2007’s A Seed is Sleepy will be happy to see A Butterfly is Patient (Chronicle Books, May 2011), again from author Dianna Hutts Aston and illustrator Sylvia Long. I’m heading out of town today to do this tomorrow in gorgeous East Tennessee. I get to talk about my favorite picture books of 2011 at an event sponsored by The Center for Children’s & Young Adult Literature at The University of Tennessee and Knox County Public Library, so color me happy. (But also busy. Super. Do I owe you an email? I’ll get to it soon, I swear.) Anyhow, before I leave, here’s some art for you. At last week’s Kirkus column, I took a look at the author/illustrator debuts from Sophie Blackall and Lauren Castillo. Both women have illustrated many titles previously, but they’ve recently released picture books they penned themselves. John Manders also weighed in over at that column on what’s it like write your own tales: His author/illustrator debut will be this Fall with The Really Awful Musicians (Clarion). So, to read more about the books and what I like about them, you can hit last week’s column. But today I share some spreads from Sophie’s and Lauren’s books. First up is art from Lauren’s Melvin and the Boy, released by Henry Holt in July, also mentioned here in the New York Times in early July. 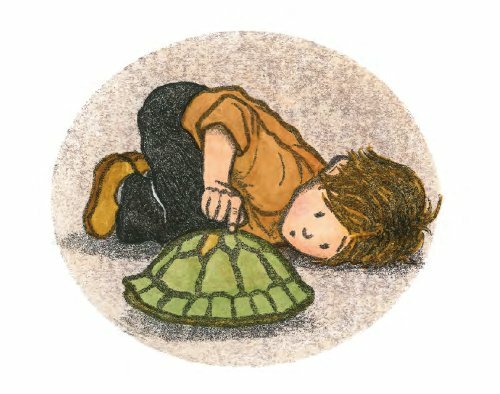 (The illustration opening this post comes from Melvin and the Boy.) After that is Sophie Blackall’s Are You Awake?, released by Henry Holt/Christy Ottaviano Books in May. Hey, you. Yes, I’m waving at you, talented illustrators of the world. Please note this call for entries from the Society of Illustrators. 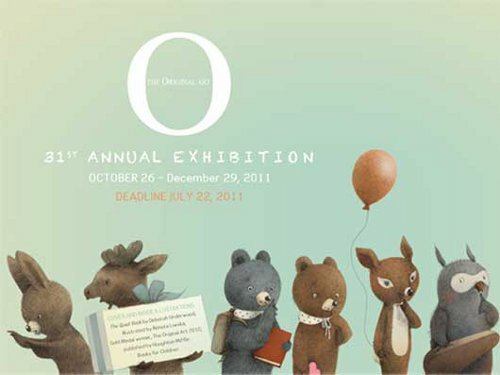 The Original Art: Celebrating the Fine Art of Children’s Book Illustration award/exhibition has celebrated the art of children’s book illustration for over 30 years. 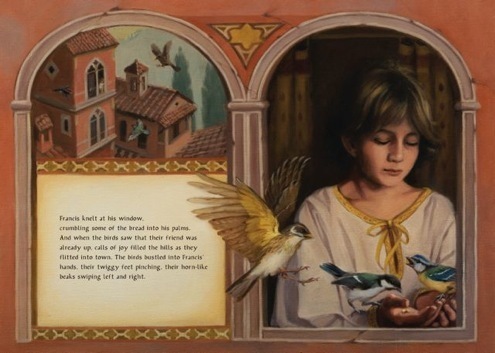 The annual exhibit in NYC showcases the year’s best children’s books. Sponsored by the Society of Illustrators, Gold and Silver medals are awarded by a jury to three chosen books representing a wide variety of medium and technique. At the Call for Entries page at the Society’s site, you will see all the information you need to know — who may submit (illustrators, agents, writers, and publishers); eligibility; how to enter; the entry fee; etc. So head on over there, if you’re so inclined. The deadline for entries is July 22. Now back to your regularly scheduled coffee . 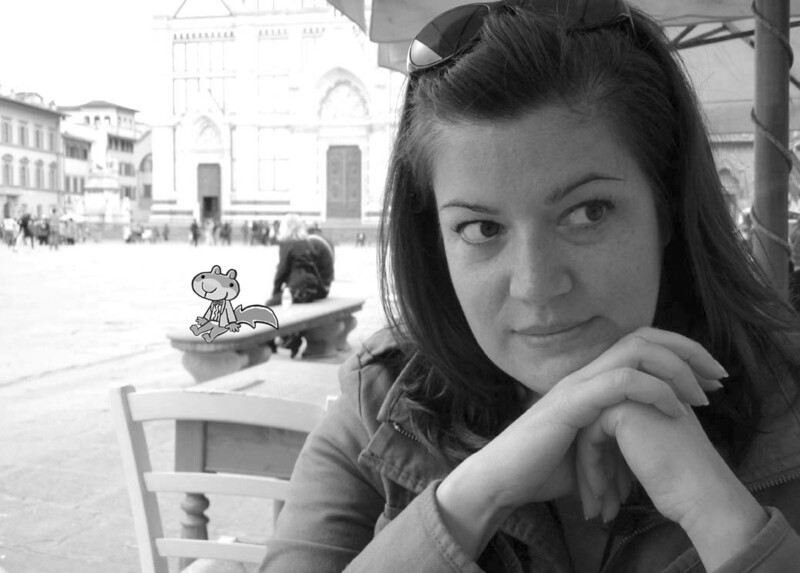 . .
Here’s author/illustrator Mélanie Watt, who has brought us one of contemporary children’s literature’s most memorable characters, being stalked by said character in Florence, Italy. Okay, so perhaps he’s just hanging out with her. He is a bit neurotic after all and probably just wants some company. Scaredy Orville Squirrel. My favorite defeatist. Children’s lit’s dearest doomsayer. A wunderkind of a worrywart. What I love about this guy is that I relate to him just a little bit. (What? Name me someone who doesn’t have a little bit of that neurosis and then a little bit of another.) 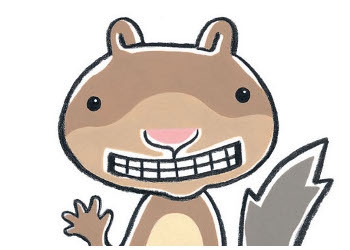 And yet as a parent, who tires of the overly-sanitized, fear-of-letting-your-kids-play-in-the-dirt Age of the Antibacterial Soap we currently live in, I laugh to myself and nod my head over Scaredy Squirrel’s little epiphanies at the close of each book, his realization that leaping into the unknown at least makes life a wee bit interesting, his reminders to us all to chill out a bit when it comes to the hyper-protective parenting. Power to Scaredy Squirrel for knocking us upside the head and reminding us to take risks, ditch the fear a bit, and calm down a lot. Before the summer gets away from us all (well, times flies when you’re busy, and before we know it, school will be starting), I’m showcasing today one of the most summery picture books I’ve seen this year, Pig Kahuna (Bloomsbury, May 2011). 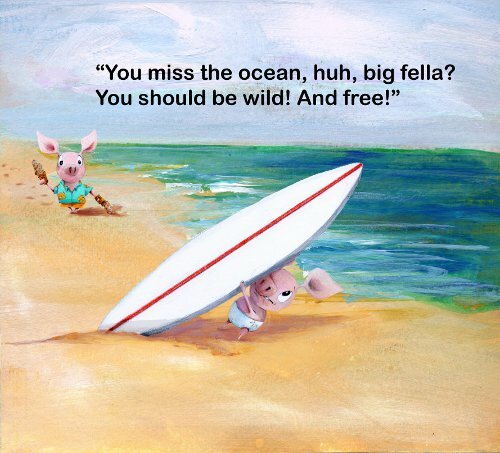 This is the third picture book from fine artist Jennifer Sattler. 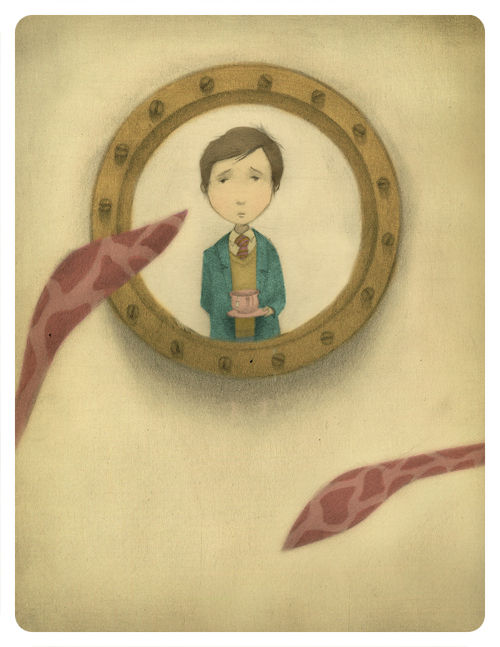 (This 2009 7-Imp post features art from her first two titles.) 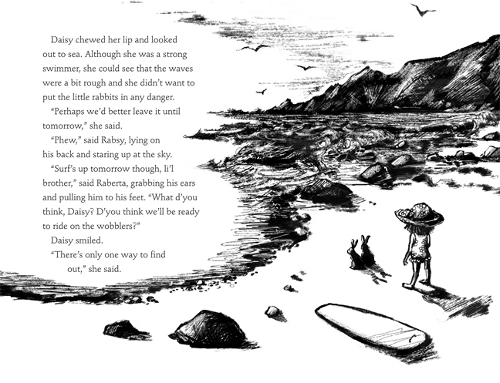 It tells the story of Fergus and his baby brother, Dink, who are collecting treasures at the shore one day: Seaweed. A pebble that looks like an eyeball. A shell that might really be a shark’s tooth. Their collection grows. And all is well, “as long as Fergus didn’t have to go in the water.” There is the “lurking, murky ickiness factor of the water,” after all. This morning over at Kirkus, I take a look at two picture book debuts. These are debuts in the sense that they come from two illustrators who previously have not written their own books. Yup, they’re branching out on their own now, both writing and illustrating for the first time, and I happen to think the results are good. The link is here this morning. 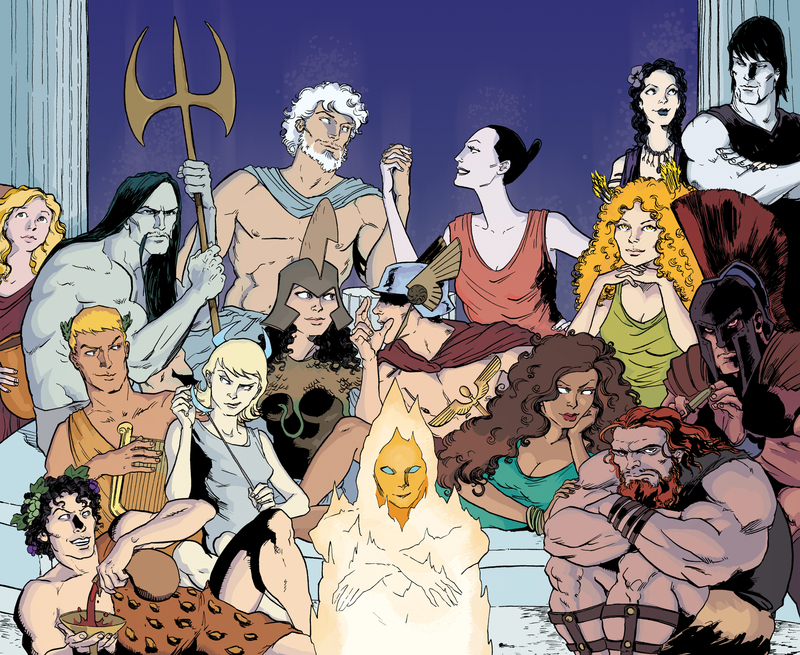 Last week, I posted an abbreviated Q & A with George O’Connor, the creator of the Olympians series from First Second Books. These are graphic novels about the gods and goddesses of Greek mythology, and O’Connor loads ’em up with vibrant art, snappy dialogue, and rip-roarin’ action. Below is the full interview (and just below here is George at his computer, “trying to look busy,” he says), complete with some illustrations and sketches. I thank George for stopping by.